I was viewing the Westall ufo case from Melbourne in 1966, as it was the 50th anniversary of this incident. grown ufo encounter. It got me thinking on a number of fronts, with ideas I hadn’t previously thought about. next to as a school boy. He said that at the time he ‘could feel the heat coming off it’ then it slowly took off and went up through the tree tops. Is he telling the truth ? If not, he’ll get an academy award, as other witnesses would, for his acting. pilotless, travel across intergalactic space, only to plop down in the back streets of Westall. ( I’m aware of other sized craft seen that day ). My premise being that it is from here, not somewhere out there in space. In all the ufo stories I’m aware of I’ve never come across one where the witness describes a craft that is so small. stories about the actions of authorities afterwards then about the initial incident. here and not from outer-space. here, not out there in space. crescent or cigar shapes or sometimes triangles like that huge shape that drifted over Phoenix a while back, all aerodynamic. an atmosphere such as here on earth, as are all man-made aircraft. entry, even if it does fly like a pair of plyers. That shape is not needed when they are outside our atmosphere floating about. In 1969 when the lunar module descended onto the moons surface not one bit of its shape and design was aerodynamic. through outer-space with equal measure and subsequent effects. ? windscreen when it starts dipping towards earth, all this because of friction against our atmosphere. and the eventual disintegration of the craft. shuttle are there for protection from extreme heat when re-entering earths atmosphere but not for when they are out there in space. matter, so why are ufo’s shaped aerodynamically if they aren’t made to travel through our atmosphere. then reflects a zero understanding of flight technology and our imagery now reflects our understanding of it. taken to another planet, that's because it all happens here on earth. the day, why would they travel light years back home just to come back tomorrow for some more buzzing. their craft used in earth's atmosphere reflects this. come from outer-space to do this. it sounds a bit farfetched. it’s a fresh way of thinking about the ufo phenomenon and those other living beings that pilot those craft. Hey Tuckeroo, That’s some post there! Lots of points to discuss, but at this stage, I’ll just say one thing. If you are a serious researcher, you will be aware of many 100’s of reports of occupants associated with landed craft. Most of the descriptions of these beings are 3-4 foot tall with insect like heads. And there are a lot more incredible shapes and sizes. They sure don't look like us! It has been stated by military witnesses on the Disclosure Project that we are being visited by over 50 different races of star people that they know of. The evidence available strongly suggests they are not of this Earth. However, I also believe we have reverse engineered alien craft and have been flying them for many years. Lots of evidence for that… check out this deathbed confession from Ben Rich, former CEO of the Lockheed Skunk works. Probably the most serious UFO phenomenon researchers of the last century, Dr. J.Allen Hynek (Advisor to the US Air Force, Project Sign and Project Blue Book) and Jacques Vallee (Astronomer, Astrophysicist and Computer Scientist) exhaustively studied the UFO phenomenon and concluded that the craft and occupants were most likely inter-dimensional rather than inter-galactic. In regard to them being of human origin, I find that difficult to believe. While interactions with governments are likely and probably unavoidable, reverse engineering inevitable and cover-ups obvious, the entirety of the phenomenon must be taken into account. In western media there seems to be a deliberate blackout on UFO sighting reports even though the estimated yearly sightings is approaching 6 to 8,000 worldwide. In some areas of South America they appear almost as regular as clockwork. The sheer volume of activity, that seems to be increasing, would in my view preclude them being of human origin. Definitely some interesting info in your link. I watched the Phoenix light’s doco’s again. These day’s I take it for granted that there is always a cover-up by authorities in these matters…when is enough evidence not enough ? Having said that, I understand why there are cover-ups and why the authorities want it all forgotten about as soon as possible. development of technology which seems be the time our interaction with et’s was raised to a whole new level. themselves or appropriated it from et’s by, as your post suggests, reverse engineering alien craft which is probably the scenario. of time. Maybe in another dimension as stated by Hynek and Allen in TP’S post. flew around haphazardly, landed, taken off again as if they are momentarily disorientated from their flight paths or geographic intentions. As opposed to the Ariel school incident were it seems like the et’s purposely landed and chose to reveal themselves to the students. The 3 foot insectivorous beings are the real deal and don’t need flying lessons. I hope the 50 odd races all get on and don’t end up fighting amongst themselves with us in the middle of it all. be warming up to a bit of serious ufo research. Those hypothetical conclusions came from more than 30 years ago. Modern thinking is that ET travels across inter stellar space from nearby stars using advanced trans-dimensional physics. Star systems such as Zeta Ricticuli are 39.5 light years distant. Somehow a wormhole in the space-time continuum is created allowing a craft to literally disappear from this dimension and then suddenly re-appear at another point in space and time. Some aliens are possibly millions of years ahead of us with their technology. They have become the masters of time and space. The cosmos is said to be 13.8 billion years old and our local star (the sun) is only around 4.5 billion years old. With a billion being a thousand million, a few million years each way is hardly noticeable. So this scenario becomes very real. Astronomers say there are more stars in the heavens than grains of sand on every beach on Earth…and just about every star has planets… so it is easy to imagine there are myriads of alien races out there. And just like us, I bet they love to explore. It all makes sense… at least to me! Friction doesn’t exist. The reason for this is that UFOs can create a ‘bubble’ of magnetic energy around their craft. This overcomes all friction with the atmosphere and allows them to zip from a standstill to literally 1000’s of kph in an instant. It’s called super advanced technology! do space craft need to be aerodynamic in our earth based understanding of 'aerodynamic' ? . UFOs don’t need to be aerodynamically shaped to work in the atmosphere or in space. That’s because they can create that aforementioned 'magnetic bubble' and in space there is no air so there’s no drag or resistance at all. So any shape will work. There has been a bewildering variety of UFO shapes and sizes reported. From huge craft at least a mile wide to small lights just inches in diameter. And just about all the shapes you can imagine. See in the chart below. There have been recent reports and good video of huge cylinder shaped craft. That's a very un-aerodynamic shape. Another indication of the ‘bubble’ is the lack of any sonic boon from these UFOs breaking the sound barrier. (around 760 mph) They have been seen and clocked on radar travelling many 1000s of mph with no reported noise. So they are definitely not travelling through the air the way our conventional jet aircraft do. However... perhaps not all craft are powered this way. The crashed Roswell craft was said to have an advanced aerodynamic shape, was very stealthy and " we learnt a lot from it". So who really knows. Accurate information has been covered up in covert black projects by the Military/Industrial complex since at least 1947. I’m a frequent sky watcher and have been rewarded with two sightings. The first was a ‘black box’ hovering over Melbourne CBD (not an aerodynamic shape at all!) and two orange disc shaped objects speeding at fighter jet pace over Dalby in Queensland. Searcher wrote: Friction doesn’t exist. The reason for this is that UFOs can create a ‘bubble’ of magnetic energy around their craft. This overcomes all friction with the atmosphere and allows them to zip from a standstill to literally 1000’s of kph in an instant. Agreed to a certain point in regards to a bubble of magnetic energy however I think they work in a different dimension.........so "friction" is then non existent. Lots of room for speculation here. I certainly agree they have inter dimensional capabilities. UFOs have often been seen to be transparent before disappearing all together. They also seem to be able to ‘blink out’ at will and re-appear almost instantly in another place in the sky. Cloaking also appears to be another ability of these craft. Dimension hopping or using that amazing anti gravity magnetic drive…. love to think all will be revealed in the not too distant future. However, I won’t be holding my breath! ...........is the lack of any sonic boom from these UFOs breaking the sound barrier. Thanks searcher, know I get it............. and that speed is why we don't see a lot of them. Ha ha Yb... you don't! Seriously though, I guess I would describe myself as a long time UFO buff who is also an astronomy enthusiast. Just love reading and learning about the universe we live in. Also love to delve into the unknown, be it Yowies or other cryptozoology mysteries. Guess a lot on here would be similar. As Mulder said to Scully... "THE TRUTH IS OUT THERE!" Hi Searcher, just getting back to this one from ages ago - I get sidetracked easily. You said "modern thinking" as if somehow new evidence had come along to discredit the conclusions of these researchers. The Extraterrestrial Hypothesis (ETH) actually pre-dates the Inter-Dimensional Hypothesis (IDH) and Jacques Vallee was originally a staunch supporter of the ETH until he realised that it ignores too much data and became a supporter of the IDH. There is usually a periodic recycling of scientific ideas that have remained hypothetical for too long and that is happening again. We are seeing a resurgence of the ETH and ideas like worm-hole travel and faster-than-light drives, etc. None of these ideas are new, just recycled again. I have yet to see any new discoveries within the field of physics or astronomy that show that worm-hole or FTL travel is possible. If evidence of energy transfer through worm-holes was recorded this would also in fact add weight to the IDH - it would not help decide between the two theories. To be honest there has been an equally as great resurgence in ideas surrounding extra-dimensionality in physics as there has been in inter-galactic travel, possibly more. Everyone hopes that CERN will detect something revolutionary in terms of energy bleeding from one dimension to another, but still we wait. I think Vallee was onto something when he started looking at the connections between UFOs, cults, religious movements, demons, angels, ghosts, cryptid sightings, and psychic phenomena. His book Passport to Magonia is on my reading list since I have just found a pdf copy online to read. I have long suspected a link between the supernatural realm and the UFO phenomena. The cryptids link is relatively new to me but to my surprise fits right in with aspects of the other phenomena. Just to be clear, I don't think all the cryptid phenomena is supernatural, I think the situation is being exploited by these inter-dimensional beings. I have a growing suspicion that the differences in phenomenon are changing to match human cultural changes. By that I mean that in ancient times when Gods and Godesses were a cultural norm as in Egypt, Sumeria, etc., the contact with inter-dimensional beings was interpreted as the visits of civilising deities because it was a culturally acceptable method of contact. In days of less scientific knowledge, when witchcraft and magic were at the forefront of society, contact with the inter-dimensional beings was accomplished through this medium. Now in the scientific age, people have no time for ancient Babylonian gods, demons, angels, faeries and the like, so enter the Extra-terrestrial Hypothesis (ETH) backed up by orbs, craft that leave traces on the ground but defy physics, "alien" visitations, abductions and contacts. The idea of a more advanced civilisation being responsible for these phenomena is more culturally acceptable to a wider number of people in the modern age. When these things are examined, there are a multitude of similarities, just a different wrapper. It is my belief that only the IDH can provide a robust explanation that covers this great a time span and such a diverse range of contact methods spanning different cultural settings through-out history. Thanks for your thoughtful post. I think we’re mostly on the same page as I don’t disagree with anything you say there. I wish I was as well read as you, but I’m probably ‘well watched’ instead. Sure, I like to keep up with the latest Yowie developments, but to be honest, my main area of interest has always been the UFO/ET scene. Perhaps because I think I understand it a bit better…! My thoughts on the most likely scenario at the moment are these; Many ET races, around 57 if you believe a Disclosure Project witness, have been visiting the earth for millenniums. On a new Stephen Hawking special the other night it was stated that scientists now estimate there are over 300 billion stars in the Milky Way. I remember when that number was ‘only’ 100 billion! It was also said there are an estimated 500 million rocky earth like planets in this galaxy. And that number grows to a staggering 400 quadrillion in the known universe!! 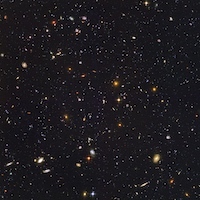 Point I’m making is that the entire cosmos is all made of the same stuff distributed by the Big Bang. So I reckon there has to be intelligent life throughout the universe as there must be virtually countless habitable planets to support it. My belief is that advanced alien races are travelling the universe through time and space using a form of physics that allows faster than light travel through other dimensions. So even inter-galactic travel is possible. As stated elsewhere, former Skunkworks CEO Ben Rich alluded to this and said we now know how it is done. There is also the free energy situation locked up in this technology as well. Read zero point energy here, but that’s another story. I have also been following the CERN experiments. Let’s hope they don’t create that mini black hole scientists are talking about! The link between UFO’s and other phenomena is interesting. Skinwalker Ranch comes to mind. I used to think the link was tenuous, but now my mind is more open. I believe ghosts exist (or vibrate) in another dimension and can sometimes cross into ours. Cryptids…well, I was firmly in the F&B camp because it was logical and appealed to my common sense. However, I now acknowledge the jury is waiting for some positive evidence from either side. Would be nice if it happens soon. Go Rusty!